Dr. Lewis was visiting associate professor in the Philosophy, Politics, and Economics Program at Duke University, a position funded by the Anthem Foundation for Objectivist Scholarship and by the BB&T Charitable Foundation. He was also adjunct associate professor of business at University of North Carolina at Chapel Hill. After a 25-year career in business, he changed direction and earned his PhD in classics in 2001 at the University of Cambridge in Cambridge, England. Dr. Lewis lectured internationally and was well known and respected by his colleagues at Duke. 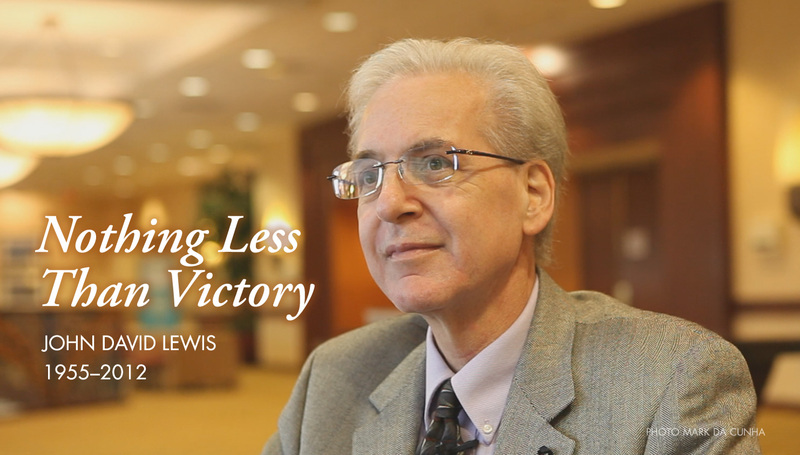 Dr. Lewis authored three books—Nothing Less than Victory: Decisive Wars and the Lessons of History (Princeton University Press, 2010); Early Greek Lawgivers (Bristol Classical Press, 2007); and Solon the Thinker: Political Thought in Archaic Athens (Duckworth Press, 2006)—as well as many other publications in academia and in the popular press. He was a frequent lecturer at Objectivist and non-Objectivist conferences throughout his career. Dr. Lewis drew personal inspiration from Ayn Rand’s philosophy—and his work and life reflected his beliefs. He had a unique talent for conveying his knowledge and views, whether in delivering a lecture, writing a book, or in discussion with those around him. The goal of a war is to defeat an enemy’s will to fight. But how this can be accomplished is a thorny issue. Nothing Less than Victory provocatively shows that aggressive, strategic military offenses can win wars and establish lasting peace, while defensive maneuvers have often led to prolonged carnage, indecision, and stalemate. Taking an ambitious and sweeping look at six major wars, from antiquity to World War II, John David Lewis shows how victorious military commanders have achieved long-term peace by identifying the core of the enemy’s ideological, political, and social support for a war, fiercely striking at this objective, and demanding that the enemy acknowledges its defeat. Lewis examines the Greco-Persian and Theban wars, the Second Punic War, Aurelian’s wars to reunify Rome, the American Civil War, and the Second World War. He considers successful examples of overwhelming force, such as the Greek mutilation of Xerxes’ army and navy, the Theban-led invasion of the Spartan homeland, and Hannibal’s attack against Italy—as well as failed tactics of defense, including Fabius’s policy of delay, McClellan’s retreat from Richmond, and Chamberlain’s appeasement of Hitler. Lewis shows that a war’s endurance rests in each side’s reasoning, moral purpose, and commitment to fight, and why an effectively aimed, well-planned, and quickly executed offense can end a conflict and create the conditions needed for long-term peace. Recognizing the human motivations behind military conflicts, Nothing Less than Victory makes a powerful case for offensive actions in pursuit of peace.